The Bourda cricket ground in central Georgetown today, April 4. The picture doesn't show that it's pouring down fat drops of rain. 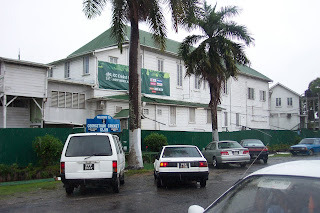 The Bourda has been used for internationals in Guyana for a century and was built under the British empire, but it's been replaced by the new National Stadium. It's made of wood and is surrounded by creeks, which regularly flood the ground.